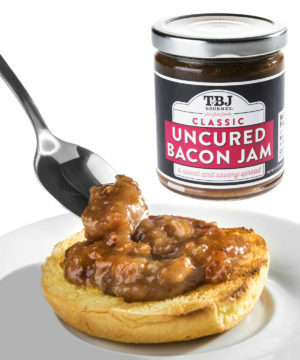 Bacon Jams: Spreadable jelly graced with real bacon. 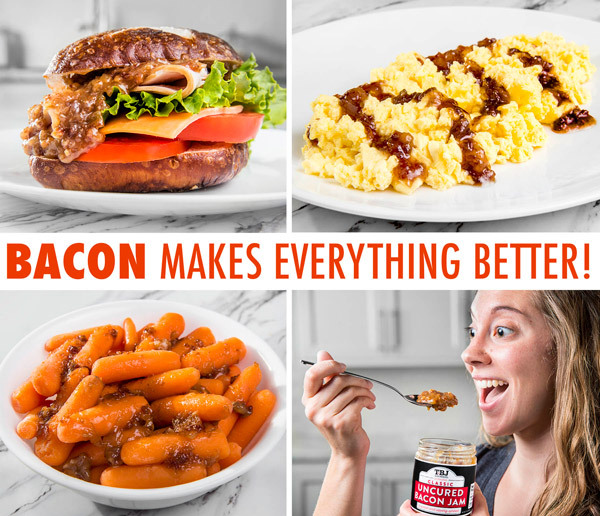 Bacon is delicious, so it's about time someone turned it into a spread! Sweet, salty, savory, and slightly smoky flavors mingle together in this spreadable accompaniment made with real pieces of bacon. Smear it on breakfast toast, enhance hors d’oeuvres, and spoon it over anything that could use more bacon (i.e., everything)! Bacon Jams will make your taste buds sizzle with delight. If you've ever needed a means to slather bacon on everything you eat, Bacon Jams is exactly what the doctor ordered. (That's probably the only context for that phrase to be appropriate). The smoky taste of meat paired with sweet dark brown sugar can elevate a simple piece of bread into a bacon feast, and it's ready to spread straight from the jar. Let us be clear: Bacon Jams is actual bacon spread. It is not bacon-flavored spread. It is not a spread with some bacon in it. BACON JAMS IS. SPREADABLE. BACON. If you weren't aware, FDA food labels list ingredients in order of their weight. The first ingredient on the Bacon Jams label is cooked bacon. The remainder of the ingredients (sugar, onions, and vinegar) serve to make the bacon spreadable while enhancing the flavor of the savory bacon. So what exactly is Bacon Jams, the bacon-based condiment, to be used on? Anything that you wish tasted more like bacon! From simple toast to whole dish incorporations, Bacon Jams can enhance the flavor of a multitude of foods. Pair this porcine pâté with breakfast eggs, move on to baconated vegetables for lunch, and finish the day off with a bacon-ified burger. Question: What's in it besides bacon? Answer: Cooked Bacon (Pork, Bacon Cure [Water, Salt, Sodium Phosphate, Sugar, Hydrolyzed Soy Protein, Sodium Erythorbate, Flavorings, Sodium Nitrate]), Dark Brown Sugar, Onions, Apple Cider Vinegar, Turbinado Sugar. Contains less than 2% of: Pectin, Gum Acacia, Xantham Gum, Garlic Powder, Citric Acid (acidity regulator). Contains Soy. Question: Can I eat it straight from the jar? 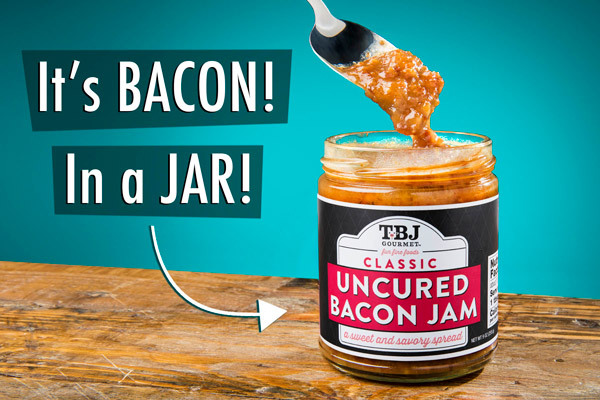 Answer: Bacon Jams is meant to be a condiment, but once you open the jar, you can do anything you want to.